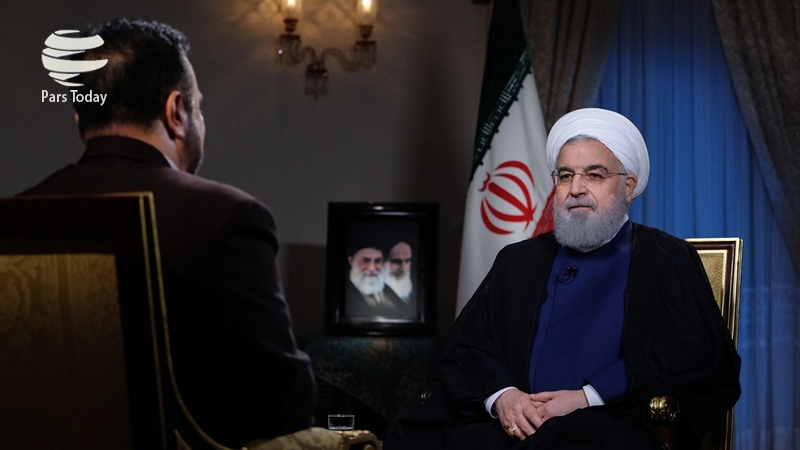 President Hassan Rouhani says the US administration is no more able to prove its trustworthiness for any negotiations after its withdrawal from the Iran nuclear deal and a number of other international treaties. According to Press TV, Rouhani made the remarks in a live televised interview on Monday, in which he answered questions on Iran’s domestic issues and foreign developments, particularly after the US withdrawal from a landmark nuclear agreement, officially known as the Joint Comprehensive Plan of Action (JCPOA) in May. “We are always in favor of diplomacy and talks … But talks need honesty … The US re-imposes sanctions on Iran and pulls out of the nuclear deal, and then wants to hold talks with us,” the Iranian president said. “Negotiations with sanctions doesn’t make sense. They are imposing sanctions on Iranian children, patients and the nation,” Iran’s chief exective said. “If you’re an enemy and you stab the other person with a knife and then you say you want negotiations, then the first thing you have to do is remove the knife,” he added. The president further stated that a recent call by US President Donald Trump for direct talks with Iran was only aimed at creating division in the country. “Trump’s call for direct talks is only for domestic consumption in America … and to create division in Iran,” Rouhani pointed out. “They want to launch psychological warfare against the Iranian nation,” he added.